Hagi ware. A general name for pottery made in the Matsumoto 松本 area of western Hagi City and in Nagato Fukawa 長門深川 in present-day Yamaguchi prefecture The kilns were sponsored by Mouri Terumoto 毛利輝元(1553-1625) who brought the Korean potter brothers Yi Kyong (Jp: Li Kei 李敬) and Yi Chak-kwang (Jp: Li Shakkou 李勺光) to Hagi, the new clan seat in 1604. Reflecting the simple tea taste sought by the Mouri patrons, hagiyaki, especially teabowls, recall Korean Ido 井戸 ware. The 1717 discovery of the daidoutsuchi 大道土 clay, which produced subtle changes in color and texture during pine-fueled firing, was instrumental in the development of hagiyaki; when mixed with the more fire-resistant mitaketsuchi 金峯土 clay, the changes multiplied. Hagi pots are very rarely decorated with painted motifs, but rely on wood-ash glazes like isabaiyuu 藁灰釉, or a straw-ash glaze shirohagigusuri 白萩釉, to create a lightly colored surface. The muted qualities of Hagi ware evolve with use because the clay absorbs some of the liquid in a process called chanare 茶慣 or hagi-no-nanabake 萩の七化け (the seven changes in Hagi). A wedge was often cut into the foot of the bowl. Purposely damaging goods was a formalized gimmick to allow potters to sell to commoners when hagiyaki was reserved for the upper class. 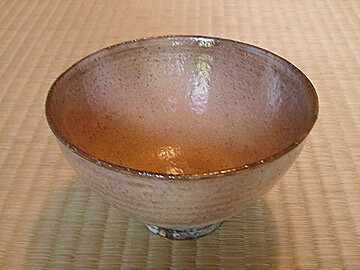 Tea bowls, flower vases and sake vessels are the most common Hagi ware.